CLAN houses in Penang are assets which need to be well-preserved as they hold so much of historical and cultural values. Bearing this in mind, Cheah Kongsi had taken various initiatives to restore its clan house and the surrounding houses three years ago. Adding on to that, it has now started work on restoring some of the dilapidated shop houses situated in the core zone of the George Town UNESCO World Heritage Site. The efforts to maintain these buildings (clan houses and the surrounding shop houses) by the Cheah Kongsi was commended by the Chief Minister Chow Kon Yeow who attended a Chinese New Year open house at the Seh Tek Tong Cheah Kongsi this evening. Lion dance on high poles performance adds on to the excitement of the CNY celebration at Seh Tek Tong Cheah Kongsi. “It is commendable that Cheah Kongsi is continuously putting forth efforts to restore the Category II heritage houses, which will also play a role in reviving the intangible cultural and historical value of these buildings. This will greatly benefit the younger generation. “Cheah Kongsi, which is under a good leadership, is an active participant in the preservation and restoration of tangible heritage as well as the Intangible Cultural Heritage (ICH) of George Town. “This is a testimony of the good work of the community which indeed contributes in adding value to our city. “Even though we have been inscribed as the UNESCO heritage site we would have easily lost it, if not for the great efforts put up by various parties, including the authorities and also UNESCO in maintaining it,” said Chow. State Tourism Development, Heritage, Culture and Arts Committee chairman Yeoh Soon Hin, who was also present, stated that Penang government is ready to help Category II heritage building owners to revive their premises through the George Town Heritage Habitat Seed Fund. “We have received three applications for the fund, namely Leong San Tong Khoo Kongsi, Seh Tek Tong Cheah Kongsi and Sun Wui Wui Koon recently. “The state government also welcomes feedback and ideas to safeguard our Penang cultural heritage,” he said. 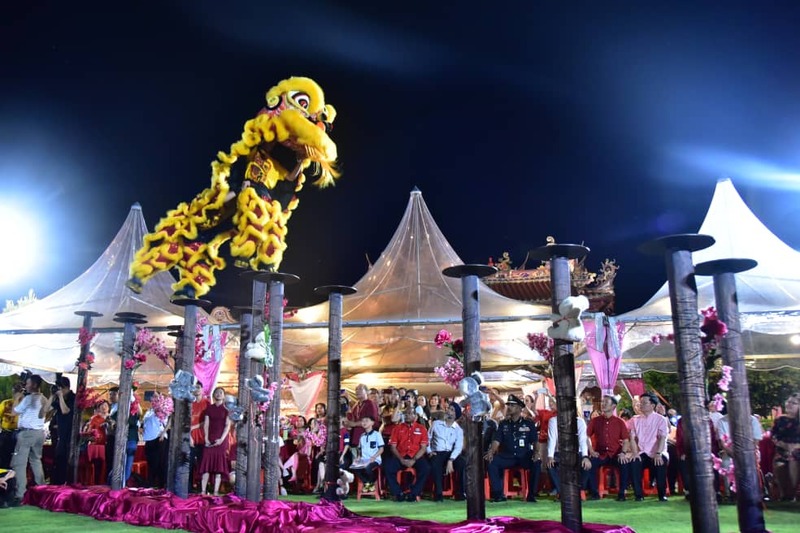 Penang Island City Council (MBPP) mayor Datuk Yew Tung Seang, Penang chief police officer Datuk T. Narenasagaran and Seh Tek Tong Cheah Kongsi chairman Cheah Swee Huat also joined the vibrant Chinese New Year celebration. Furthermore, the Cheah Kongsi will be participating in the restoration of the facade of six shop houses along Jalan Gurdwara under the Business Improvement Development Scheme (BIDS) project.